Rad Ride Station is a mission in the Octo Expansion. The stage is a Tower Control match in Snapper Canal against a team of sanitized Octolings. 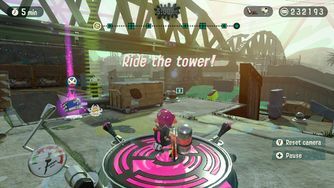 Like all the Tower Control missions in Octo Expansion, the tower starts from the point next to the player's spawn point compared to being in the middle in multiplayer battles. The tower follows the same path it has in the mode, where the goal lies next to the opponent's spawn point and the player gets 5 minutes to accomplish the objective. Near the player's spawn lies an infinite supply of a can containing the Baller special. There is no limit on how many times Agent 8 can respawn, where a launchpad will appear if the player gets splatted that Super Jumps directly onto the tower. The sanitized Octolings will Super Jump close to the player and attack them at different points as the player progresses with the tower. There are 6 checkpoints in total. At checkpoint 1 an Octoling with the Blaster appears on the raised square platform by the river on the player's side of the map. At checkpoint 2 an Octoling with the Splat Brella and Burst Bomb appears behind the bumber on the slope nearby. At checkpoint 3 an Octoling with the Splat Brella appears close to the center of the map. At checkpoint 3 an Elite Octoling with the Blaster and Inkjet appears at the slopes from the player's side of the map close the center. At checkpoint 4 an Octoling with the Splat Brella Super Jumps onto the tower. At checkpoint 5 an Elite Octoling with the Splat Brella and Ink Storm appears on the elevated area connected to the spawn, standing above grating. At checkpoint 6 an Elite Octoling with the Blaster with the Inkjet appears in front of the enemy spawn point. At checkpoint 6 an Octoling with the Blaster and Autobomb will Super Jump and deploy a Splash Wall onto the tower. At checkpoint 6 an Octoling with the Splat Brella and Burst Bomb appears on the raised square platform by the river on the enemy's side of the map. At checkpoint 6 an Elite Octoling with the Blaster appears on the other raised platform by the goal. The subtitle is a reference to the Will Smith song, "Just Cruisin'". The Japanese name of this station is a pun on Maitchingu, "I'm beaten". It is a buzzword in the 80's Japan. Rad Ride Station is the only Octo Expansion mission to use the Aerospray MG.
French Gare au grand plongeon ! Conduis le stand mobile ! Watch out for the great dive! German Sturm auf den Turm! Fahre auf dem Turm zum Ziel! Storm on the tower! Dvigay bashnyu! ...From what district? Take the tower to the goal. This page was last edited on 1 March 2019, at 17:30.